Schmidt's Natural Deodorant Stick is a rather popular brand. Over 4,800 customer reviews, 3.8 stars on Amazon, and mostly positive reviews. However, there is something that one person suggested that came well received as helpful by many users. Let's get into it and see what Schmidt's Natural Deodorant Stick is made of. Schmidt's Natural Deodorant Stick is, obviously as the name suggests, a stick deodorant. this is important mostly for a convenience reason. Most people are more than used to the stick deodorant so this is obviously the most popular choice for people just getting into the natural deodorant game. Plus it is pretty much the best overall choice, as it both deodorizes and absorbs sweat well. Many natural stick deodorants are usually made up of a form of natural oil or butter, like shea butter, along with baking soda, or one of the other natural absorbents, and essential oils for the fragrance. In fact, there are several essential oils that are antibacterial by nature, like tea tree oil or neem oil. However, these are fairly strong scents and some may not like that. When you pop the hood and take a look what is under it, you'll find a ton of great and natural ingredients. Every single one is naturally derived, in addition, they all have great benefits for your skin and overall health. The complete list of ingredients in Schmidt's Natural Deodorant Stick are as follows: Maranta arundinacea (arrowroot) powder, Cocos Nucifera (coconut) Oil, Euphorbia Cerifera (candelilla) Wax, Butyrospermum parkii (shea butter), Sodium bicarbonate (baking soda), Caprylic/Capric Triglyceride (fractionated coconut oil), Simmondsia Chinensis (Jojoba) Seed Oil, Cedrus deodara (Himalayan cedar) essential oil, Juniperus (juniper) essential oil, Tocopherol (vitamin E). Schmidt's Natural Deodorant Stick uses two different ingredients to ensure that you do not have to worry about sweat. Those ingredients are Arrowroot Powder, and Baking Soda. Now Baking Soda can result in a rash if you are someone who is sensitive to it, so it is best to check on that before using. The coconut oil, and MCT (fractionated coconut oil) are both used for their antibacterial properties, to keep you smelling great. One really great thing that I have seen is that Schmidt's Natural Deodorant stick does not include any controversial or harsh chemical ingredients, like aluminum, glycol, glycerin, or others. If you are on the edge about buying Schmidt's Natural Deodorant Stick, here are some things that may convince you. This natural deodorant is certified vegan, which is great for those living that lifestyle. In addition, this product is totally free of animal testing, making it cruelty free. Plus, all of the ingredients are sourced in the USA, and the products themselves are made in Portland, Oregon. Above all else, it seems like this deodorant actually really works. Its non-greasy, non-sticky, and only requires a small amount to last you throughout the day. Schmidt's was created in 2010, by Jaime Schmidt during the Maker Movement. Jaime wanted to make body care products that would benefit her family's health and since she saw that the current natural deodorants were falling short of customer expectations, she took it upon herself to change the way people think about deodorant. Her products contain no aluminum, no parabens, no phthalates, or any other harsh chemicals of any kind. Currently, Jaime Schmidt is still devoted to her mission to change the way people thing about deodorant. Only now, she is expanding the scope of that mission. She is constantly creating new innovations and putting out new product lines, extensions of her deodorant lines, and increasing the availability of her products. 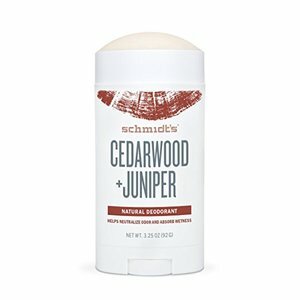 Now, Schmidt's has more than deodorant to offer you. The products now available to anyone include toothpaste, soap, and gift/multi-packs. Schmidt's is growing in the natural body care industry, trying to be the most innovative one out there. All of her products are made with natural ingredients, without including any harmful chemicals that are often found in commercial brands. Schmidt's Natural Deodorant Stick is a great way to casually and easily convert over from commercial brand deodorants. This is because since most regular deodorants are sticks, you are not making that big of a change. However, it would be far weirder to switch from a stick to a cream. This natural deodorant is also full of natural ingredients. There are no synthetic ingredients included in this or any other of Schmidt's products. Furthermore, the deodorant is certified vegan and cruelty free, being sure no animal products are included and testing was done. This stuff really works. The use of two absorbent ingredients, arrowroot powder and baking soda, ensure that you do not have to worry about sweat throughout your day. Also, there are plenty of naturally antibacterial ingredients like the coconut oil and MCT oil, that keep the body odor to a minimum. Combine both of those with the essential oils for the scent and you got yourself a fully functional deodorant. If you are worried about aluminum, don't be. Schmidt's Natural Deodorant contains no traces of aluminum in any way, shape, or form. In addition, there are also no parabens, phthalates, or other harsh chemicals. What's more, this deodorant is both sourced and made in the USA. All of Schmidt's products are made in Portland, Oregon. The ingredients also never go through unnecessary processing. There are various customer reports that have valid concerns. Many are saying that this deodorant has either turned their underarms black or dark, or it has left a rash. The rash is easily explained because Baking Soda is a common ingredient that some people can be sensitive to. However the black underarms, I got nothing for. I am not knowledgeable to pick out which ingredient would be responsible for that. In addition, some have also complained about the deodorant leaving stains on their clothes. While they say it works better than any other natural deodorant they have used, they wished it did not leave such hard stains. It is rather interesting. Even though there are various complaints about rashes, skin irritation and discoloration, those reviews also state that the deodorant actually really works. In fact, some have said that it is the most effective natural deodorant they have ever used, but because of these issues, they had to stop using. One customer actually gave some good advice that had become the top critical review on the product page. They mentioned that to avoid any skin irritation, to go with the deodorant jar, rather than the stick. Apparently, there is some ingredient that is either changed or not included in the jar variation of the deodorant that the stick has. Either way, you have your pick of the litter. I think instead of recommending the stick deodorant, it seems the better choice is going for the jar deodorant. However, if you want to try out the Schmidt's Natural Deodorant Stick, you are more than welcome to. Right now, you can grab any of the 4 scents on Amazon for $10.58. For any other information on the best natural deodorant, head on back to Green and Growing. Here are some top questions that I found for people seriously considering buying Schmidt's Natural Deodorant Stick. Does Schmidt's contain any synthetic ingredients? No, Schmidt's Natural Deodorant Stick only includes natural ingredients. Is the unscented as effective as the scented? Yes, both work very well. Does this go on clear or white? It goes on white, but is quickly absorbed by your skin.